Since our founding over two decades ago, Conexx is recognized as one of North America’s most effective organizations, connecting Israeli companies with companies and markets in the US. Our powerful influence is a function of geographical breadth and the depth of engagement of our highly engaged and connected large membership. 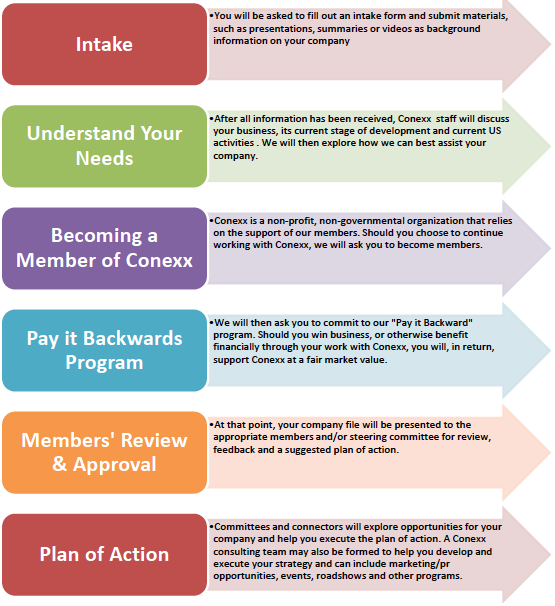 Members of Conexx, both in the US and in Israel, recognize that success does not come overnight and work towards creating value through building long-term, sustainable relationships. These relationships are often developed through an Israeli company’s engagement with one of our Connectors, special interest groups which focus on specific industry verticals. Israeli companies introduce their technology, products, revenue-model and go-to-market strategy to the appropriate Connector where members offer their initial comments and may agree to participate on a volunteer Connector Consulting Team. This team is assigned with the task of helping the Israeli company evaluate its path to market and create a program of work where Conexx, and its circle of influence, can advance the company’s efforts to penetrate the US market and, in particular, the Southeast. Connector members are experienced professionals in their industry with highly valued expertise; some are regularly retained for large sums by American and international companies. The value of consulting service performed by these teams has been estimated to be worth tens of thousands of dollars to the Israeli companies. Below is a snapshot of our step-by-step process of intake. Read more about Our Process.